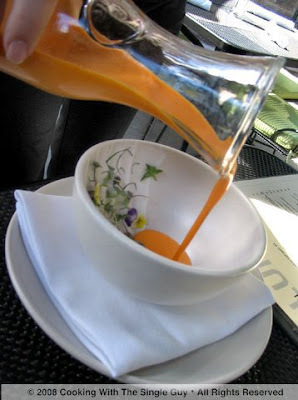 There were many things that inspired me during my recent lunch at Ubuntu, the vegetables-only restaurant in Napa. One of them was its simple Today's Leaves and Things green salad that came out looking so beautiful and tasted so refreshing with its light dressing and little bits of locally grown greens. So I decided to replicate this at home. 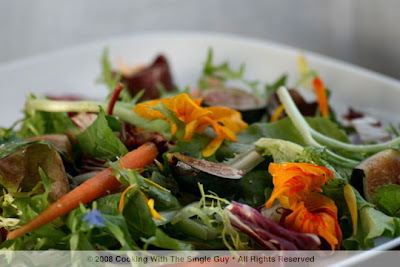 I started with a trip to the Sunday Temescal Farmers Market near my home in Oakland, and picked up a bag of mixed greens with edible flowers. That took care of the “Today's Leaves” part. For the dressing, I kept it really simple like Ubuntu. So I just mixed the juice from one lemon with high-quality extra virgin olive oil. (You know I only use the best from here.) I did add a bit of sugar because I always feel lemon is really tart on its own. So really, it was only just lemon juice, olive oil and a pinch of sugar. And be restrained when mixing in the dressing with your salad. The real trick I learned from Ubuntu was the crackling of sea salt to finish off the salad. 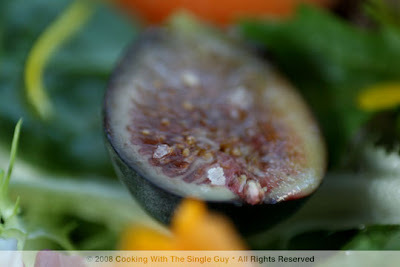 Not a whole lot, but just enough to complement the lemon juice dressing and bring out even more the natural flavorings of the carrots, figs and vegetables. 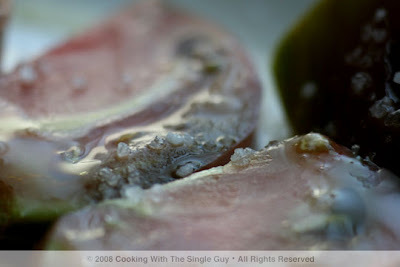 Use coarse sea salt in a grinder or sprinkle a pinch of fleur de sel. 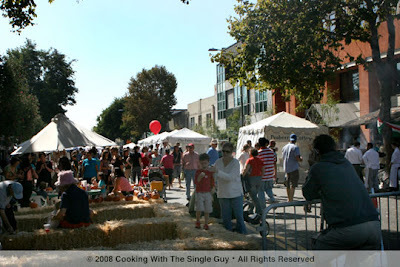 This past week we've had some nice Indian Summer weather in the Bay Area (which we believe we're entitled too because our summers are never really summer), so yesterday was perfect weather for the annual Out and About Rockridge street fair in my neighborhood, a sort of harvest celebration in a way. I mean, just look at the hay. 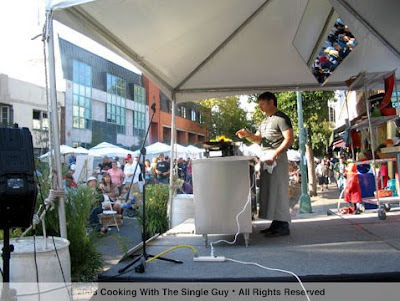 This year's event was bigger than ever with more booths and stages with music and chef demos. Here are some shots from the day. 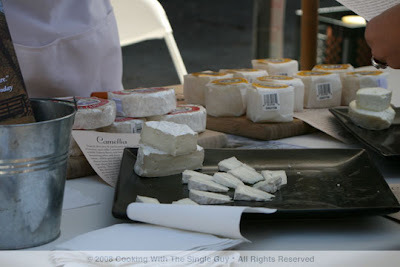 Cheese tasting from Fiscalini Farms. 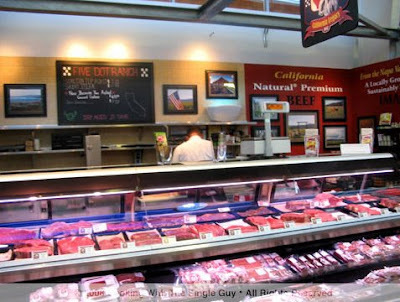 This is tri-tip from the meat market at Market Hall. 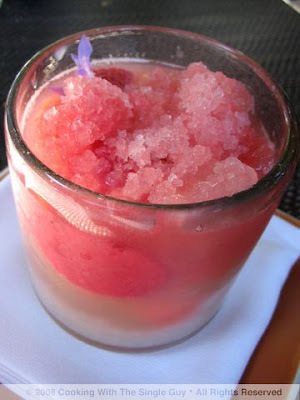 Mint Pomegranate Lemonade from Citron Restaurant. 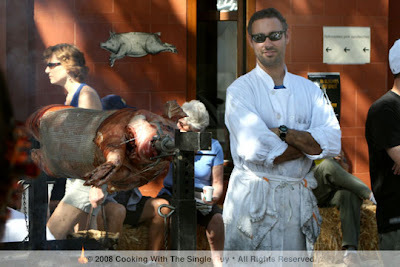 Oliveto's chef in his movie-star sunglasses standing next to a whole pig on a spit. This is liberal Rockridge, so I heard a few people walk by and say it was "cruel" or "gross." 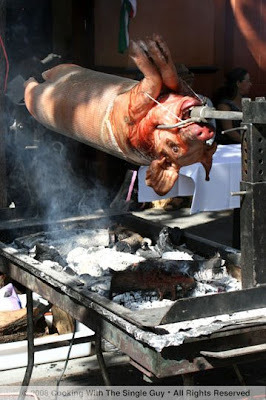 Um, the pig was already slaughtered before they placed it on the spit. At least they're not using up gas to cook it. 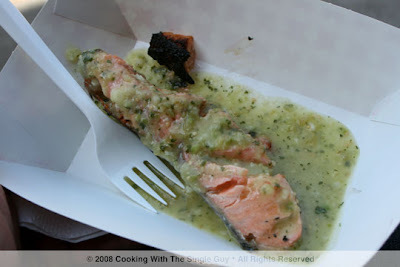 I couldn't wait for the pig sandwiches and instead got this grilled salmon with tomatillo salsa from Hupuku Fish Market. The chef's stage. Above, Joey Altman does a demo while pitching his new book, Without Reservations. The weather did change later that evening and it actually did begin to feel like fall. 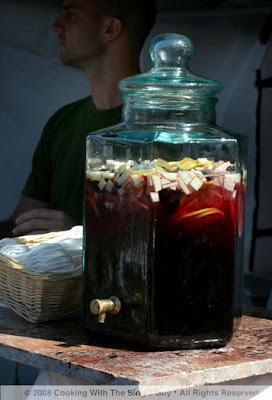 Oh well, summer only could last so long, and at least we squeezed in one last perfect street fair. My frozen yogurt taste test is slow going. Some days I’ll hit a great new find like my visit to Tuttimelon that gets me inspired to try more. 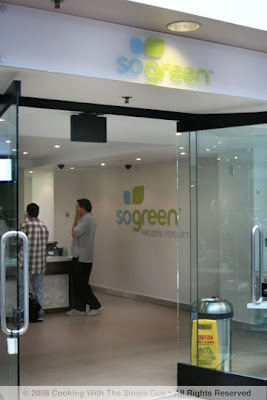 Then I try places like SoGreen that makes me question my starting this whole fro-yo eating in the first place. But maybe I’m giving away too much? Please read on. 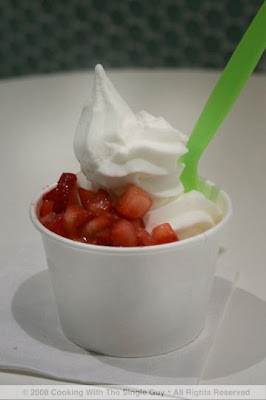 I went with my typical taste-test fro-yo, which is the small cup of original yogurt topped with strawberries. The fresh strawberries were diced oddly small, unlike other places where much of the strawberries were just halved to retain more of its natural bulk. The fro-yo itself was thick, almost like a malt. As it melted, it got a bit more liquid and smoother, but it was quite thick to begin with so it took awhile to reach that more creamy consistency. The flavor itself was OK, a bit tart but not overly tart. I can’t say I found SoGreen’s fro-yo to be very refreshing. It was good, but the flavor didn’t feel surprising on my tongue. It just tasted predictable. Plus, the service was friendly but slightly empty. They didn’t seem to really know a lot of answers to questions I had. A Wee Bit Too Early for Oktoberfest? 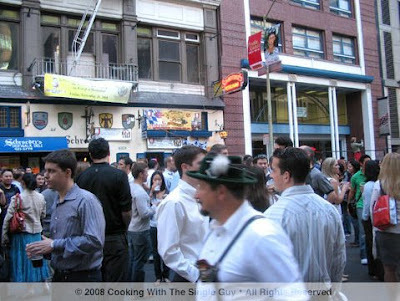 The block was closed on Front Street at California in the Financial District, so the area was crowded with a lot of after-work financial types hanging around drinking and waiting for the polka dancers to come on stage. Most of the food and drink were flowing out from Schroeder's, which I guess was the main sponsors of the street fair. 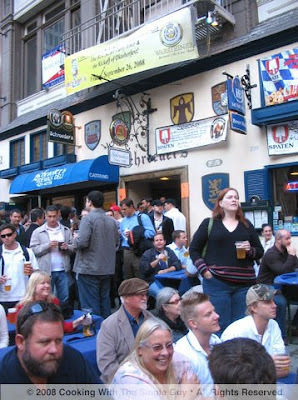 A sign says they were celebrating 115 years, but I wasn't sure if that was 115 years of Oktoberfest or of Schroeder's. Anywho, I don't think the crowd really cared. I think they were just glad to have a street party on a Friday night. Woo-hoo, TGIF ... 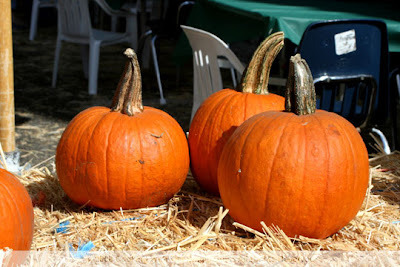 OKTOBER-STYLE!! It's prime time for heirloom tomatoes, and you find a variety of colors and shapes at the local markets. I love them. They're so unusually shaped and incredibly colorful. Oh, they taste good too. 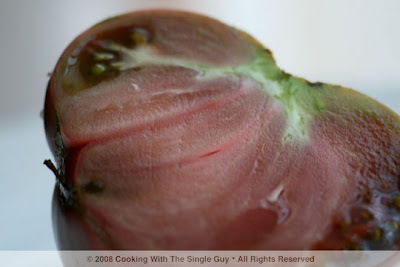 This particular heirloom tomato I got recently reminded me of meat when I cut into it. The flesh reminded me so much of raw meat. 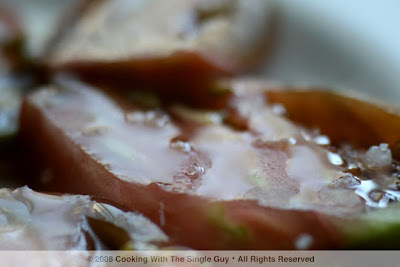 And with a good heirloom tomato, all I do is dress it with good extra virgin olive oil and sprinkle with fleur de sel. If I get fancy I might rip some fresh basil leaves and shave some parmesan cheese. All this tomato needed was olive oil and salt. It tasted so meaty, the flesh tender but firm. 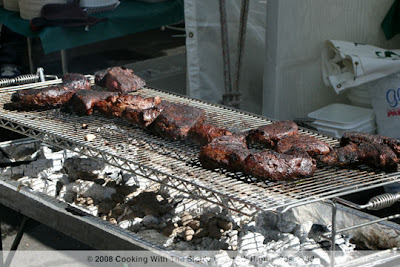 Don't you think it looks like a sirloin cut or pork chop? So slice up an heirloom tomato, and serve it up medium rare. Yum. Chef Jeremy Fox is the media darling of the national food press, being named “rising star” for his culinary repertoire of vegetable-only dishes at Ubuntu Restaurant & Yoga Studio. Yep, that’s right. It’s a restaurant and a yoga studio. So like me, you’re probably thinking tofu and lots of thin women in pastel-colored athletic wear. 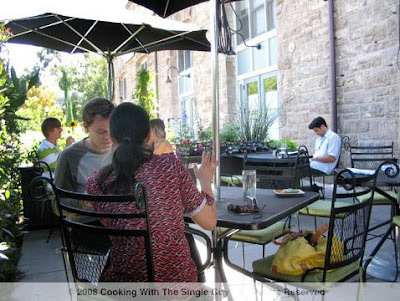 But that was far from the case from the first moment we stepped into the handsome and open space of Ubuntu’s dining room in downtown Napa. I visited Ubuntu last weekend for lunch with my fellow food blogger, Foodhoe, and her husband, Mr. K, who graciously did the driving for our quick trip up north. We were all interested in seeing what the fuss was. I’m not a big meat eater, but I do like my protein (typically from chicken, pork and any kind of fish), so I had my reservations about a whole meal based on vegetables. Foodhoe is actually on a fruit and vegetables diet so this was a real treat for her. Mr. K was just game for anything. Ubuntu (pronounced oo-BOON-two) is an African word that’s not easily translated. It has something to do with community, respect and sharing, and the restaurant reflects this mentality in the environmentally conscious design and the service of the young and friendly staff. The main room has a warm feel with its richly refurbished recycled wood and reclaimed furniture, and the walls popped with colorful abstract paintings. 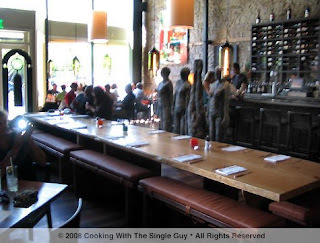 An unusual decorative item is a sculpture of humanity looking over a very long communal table at the center of the restaurant. I kept thinking it was some performance art and the four statues would come to life. Luckily, we decided to eat in the back patio so I didn’t have to worry about any attack of the artworks. I started off lunch with a watermelon wine cooler that was perfectly blended with a distinct and refreshing watermelon flavor. 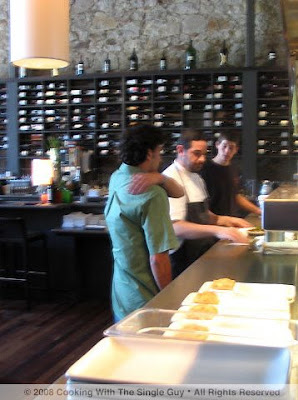 Ubuntu’s menu is made up primarily of small plates, and we were encouraged by our server to share amongst our table. So Foodhoe got us started with two plates of the “bites” (which looked mostly like bar snacks, but fancy of course). 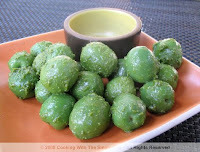 We got a plate of the Castelvetrano Olives ($5) marinated in carrot top pesto and Marcona Almonds ($5) coated in lavender sugar and sea salt. The olives were unusually green and rounded. How I wished I had a martini right about now. Anywho, the flesh was incredibly soft, almost mushy like mashed potatoes. Mr. K thought it would have been better as a tapenade, and I agreed. I felt the carrot top pesto didn’t really add anything. The almonds were addictively good like all nuts are, but they had a bit too much of the lavender sugar and sea salt. Some of you know I love love lavender, but even I know it’s not always the best match for certain foods. It’s a very distinctive and dominant herb, and in this case it seemed to be conflicted with the sugar and the savory almonds. A dusting probably would have been fine. First up was the Cool Watermelon and Lemongrass Soup ($9). The server brought out the bowl that was swept on one side with a splash of coconut milk and decorated with a mini cascade of miniature wild flowers. Then she poured the soup into the bowl in front of us. I almost thought she gave us the wrong soup because it looked like carrot soup, but she says the cooking of the watermelon turns it orange. Hmmm, I have to test that out one day. With the hints of lemongrass and kieffer lime, the soup definitely had a Thai sensibility to it. I didn’t get a strong watermelon flavor (like I did with my wine cooler) so I was still convinced that this was carrot soup. At the bottom was this sac of basil seed that Chef Fox presents as “caviar.” While it could resemble caviar, it didn’t have the salty taste. So it was an odd discovery at the bottom of the bowl, but I give him props for thinking out of the box. 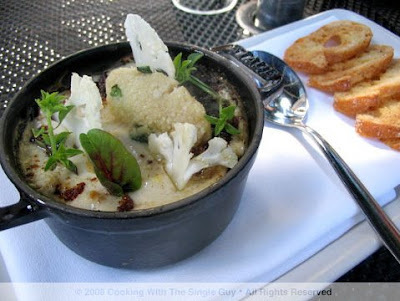 Next came one of the restaurant’s signature dish, the Cauliflower in a Cast Iron Pot ($13). This was a tiny pot with cauliflower made in three ways as a real tribute to probably one of the more underappreciated vegetables after Brussels sprouts. Being a fan of cauliflower, I enjoyed the creamy texture of the cooked cauliflower and the roasted puree cauliflower on the top. Again, everything was beautifully plated with some thinly sliced raw cauliflower creating a backdrop. The dish was served with brown butter toast like how you would eat pate. Definitely not a small plate are Ubuntu’s pizza options. There were two on the menu. One was topped with onions and local chevre but we selected the Pizza Bianco ($16), which was a white pizza topped with bellweather ricotta, a mushroom puree and lemon thyme. The server asked if we wanted a fresh farm egg on top, and we said yes once she talked about the gooey yolk from the sunny side egg being slathered over the pizza crust. She had me at gooey. The pizza was a perfect Neapolitan-style thin crust pizza and the ricotta cheese was amazing. 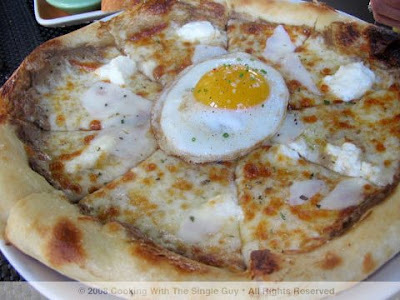 With the egg, this was the perfect breakfast pizza and was one of my favorite dishes of the day. While the menu didn’t have the typical vegetarian dishes of tofu and kale, it did have a salad (called Today’s Leaves and Things, $11). And Foodhoe and I wanted to see how Chef Fox can present a salad and make it exciting. 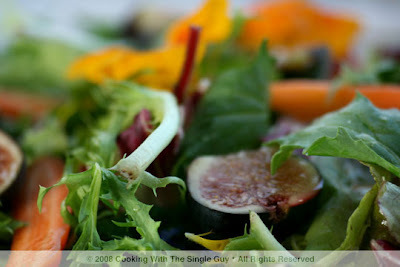 Of course, what came out was this beautiful array of field greens with fresh ingredients from the season. 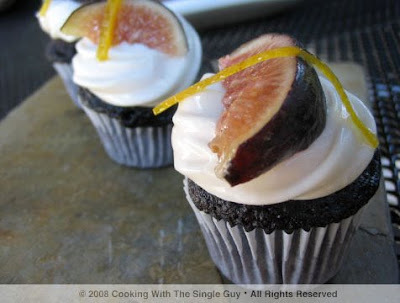 So that meant baby heirloom carrots and luscious black mission figs. 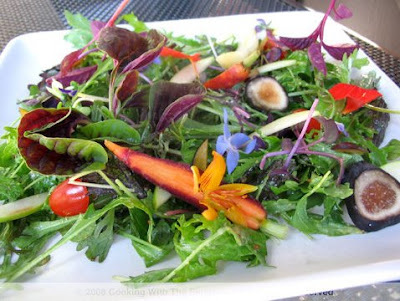 Many of the greens come from the restaurant’s biodynamic garden further north in Napa. 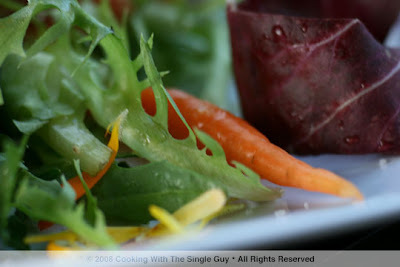 The salad was simply dressed with lemon juice, olive oil and sea salt. It was the sprinkling of sea salt that I thought was simply ingenious because it was enough to flavor the greens so you can taste their natural goodness. One of our final main dishes was another one of my favorites, and that was the Local Polenta with Corn Pudding ($14). I generally don’t eat polenta because it’s just mush to me (unless it’s day old and grilled! 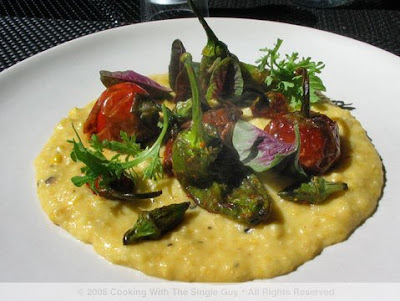 ), but this dish was wonderful with the seasonal sweet corn kernels blending in with the polenta. Everything was topped with an array of fried peppers (that really looked more like they were roasted). In the center was a dollop of sofrito, which is the Spanish paste made by slow cooking tomatoes and other vegetables like bell pepper or carrots. Sofrito is a basic ingredient in building a good paella, and Ubuntu says it makes theirs over three days! Now that’s slow cooking, and intensely worth the wait. We moved to desserts, which is prepared by Fox’s wife, Deanie. We started with what’s becoming a signature dessert: the Vanilla Bean Cheesecake in a Jar ($9). 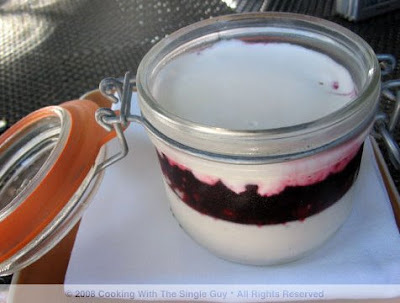 It was this cute little jar of cream and huckleberries with a layer of almond-teeccino crumble in the center. On the menu, “cheesecake” is in quotes, so it makes me think that the cheesecake portion of this dessert isn’t made from cheese. But it sure was creamy and thick. It tasted just like cheesecake and I wished there was more of it (the whipped cream on the first layer was a bit too much, I thought). As the day got hotter, a refreshing Raspberry Sorbet Float ($9) also hit the spot, mostly because it was made with rose geranium soda, and I love the subtle sweetness of rose water. The float included lychee-tapioca pearls that were soft and pleasant. My only wish is that it was served with three straws. Our last dessert was a trio of mini vegan cupcakes ($5). 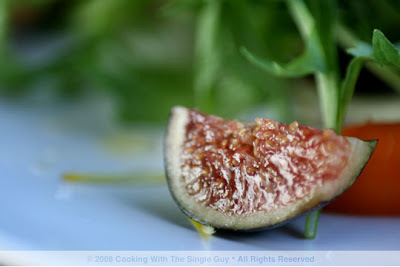 This is what we would call darling, with the slice of fig and an orange zest on top. The cake itself was Devil’s Food Cake (made with carrots) and was moist as can be, despite being vegan. It was a quick pop in the mouth, and that brought an end to our incredibly inventive lunch. Despite eating quite a few selections, I did feel the lunch menu was a bit limited. (We probably ate 75 percent of what was available.) So it would be interesting to check out dinner at Ubuntu, which also offers a tasting menu for $125. Side note: As we left, I spotted Chef Fox in the main dining room by the prep station probably going over some details for the night’s menu. This photo isn’t my best food paparazzi shot. Although I said the lunch menu was limited, I did feel full with everything we ate (it must have been the three courses of dessert). So I left satisfied and enlightened at how someone could look at dishes that celebrates vegetables instead of a vegetarian looking for sustenance. 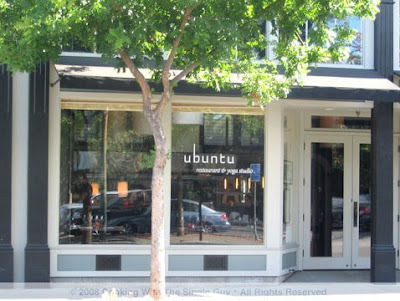 I’m sure many vegetarians would rush to Ubuntu, like how they did when Greens first opened up in San Francisco years ago. But this isn’t a vegetarian restaurant. It’s just a damn good restaurant. 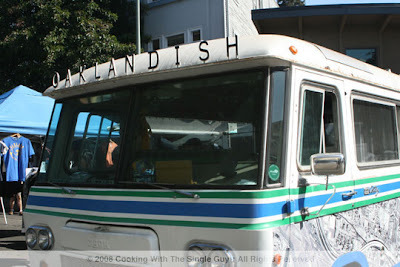 You can read Foodhoe’s take on our lunch here. 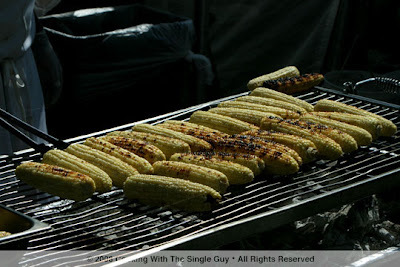 I have an assignment for all of you: If you’re ever at the farmers’ market and you see me, the Single Guy Chef, looking over a tray of purple beans, TELL ME TO STOP AND WALK AWAY. I can’t tell you how many times I’ve been so intrigued by these beautifully dark purple beans. I guess you can’t call them green beans, but they are basically green beans in disguise. 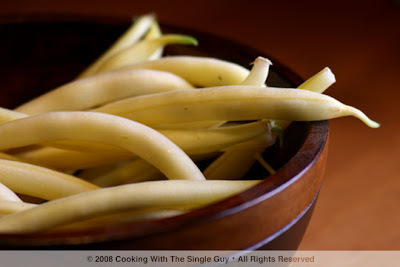 They’re as intriguing to me as the wax beans, which are yellow. So I scratched the idea of a purple bean post. A few weeks later, I’m at the same farmers’ market and again I see the purple beans. I blocked out my previous experience with the purple beans and bought a bunch—again—this time deciding to mix them with some yellow wax beans for some interesting contrast. 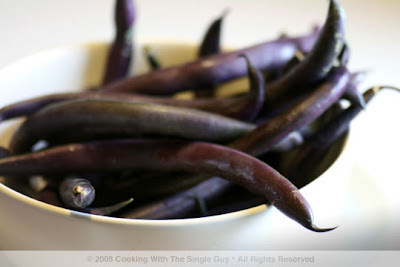 Once I started cooking, I realized that I’ve cooked with the purple beans before. And the same thing happened where they just turned into regular-looking green beans. Still, I made a stir-fry with scallops and it tasted good so despite the lack of purple in the dish, I decided to at least post the recipe. But just so it’s clear, you can just use regular green beans (or mix them with yellow wax beans) but don’t bother with the purple beans. And don’t forget, it’s your duty to stop me from buying any more purple beans. Even if I didn’t cook them and used them in the salad, the uncooked skin would be too tough to enjoy. So other than a fun show-and-tell item for the kids, just walk on by. Dang tricky color-changing purple beans! Bring a pot of water to boil and quickly blanch your beans (cooking them for 30 seconds and then placing them in a bowl of ice cold water). Drain in colander and set aside. In a small bowl, mix black bean sauce, fish sauce and sesame oil. Set aside. In a wok or large skillet, warm the Canola oil over high heat. 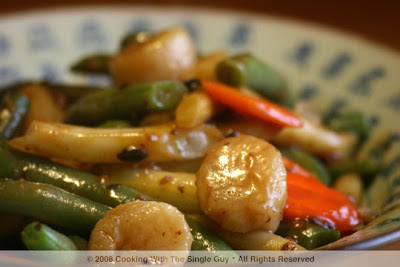 Season your scallops with salt and pepper and then add to hot wok, searing them for about a minute. 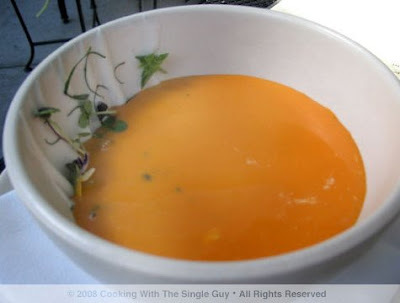 Add the carrots, and then flip the scallops to cook the other side for another minute. Add the beans and toss everything together, quickly adding the mixture of black bean sauce, fish sauce and sesame oil and toss to coat everything. In a small bowl, mix the cornstarch with a little bit of water to create a slurry. This will help create a glaze in your dish. Add it to your hot wok and toss with all the ingredients until thicken, then remove from heat. 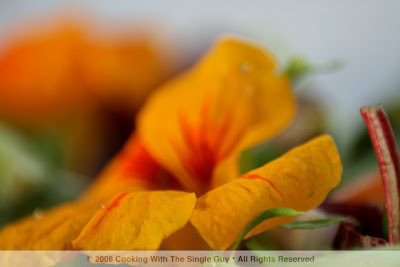 Garnish with cilantro and serve with steamed rice. TIP: When adding the cornstarch, pour a little at a time to get the glaze you want. If it looks too thick, add either water or chicken stock to thin it out. What you’re trying to get is a nice glaze that binds all the ingredients together but isn’t as thick as gravy. BLACK BEAN SAUCE: Don’t want to get all Sandra Lee on you, but sometimes it’s so easy just cooking with a jar of ready made sauce, like this standard one I always use. I usually buy the Lee Kum Kee brand of Black Bean Sauce with Garlic. It’s made from soaking salted black beans until they’re soften. This can be a pretty salty condiment, so don’t put too much. You can find it at the Asian aisle of most grocery stores or at Asian supermarkets. 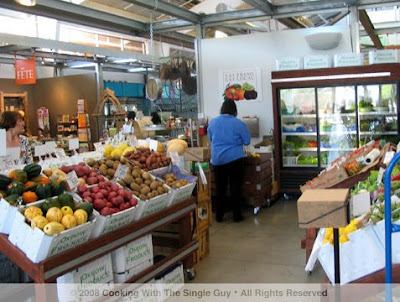 Yesterday I was in Napa with Foodhoe and her husband (yes, we were checking out another restaurant, which I'll be reviewing on Tuesday) and after lunch we made a stop at the Oxbow Public Market, the mini version of San Francisco's Ferry Building with various food shops and stands. It's been almost a year since the last time I've been to Oxbow, so it has definitely changed quite a bit. It had just opened when I first blogged about it so not every store was open. Yesterday, it looked like it was 90 percent done (there's still a few more stores to open). 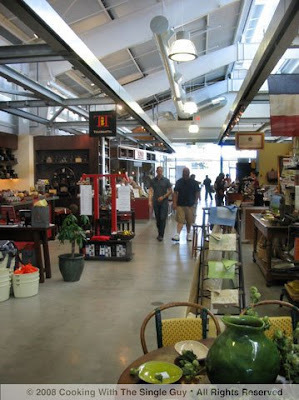 Oxbow is a bit sprawling, with a main building but several stores scattered around. When you drive up in Napa City on First Street (it's right next to Copia) you see a big Taylor's Refresher right at the corner, along with Fatted Calf. But much of the action is in the main building. ... and meat from Five Dot Ranch. Whole Spice was one of the stores that weren't ready to open when I last visited, but now it's totally opened with a large selection of spices. 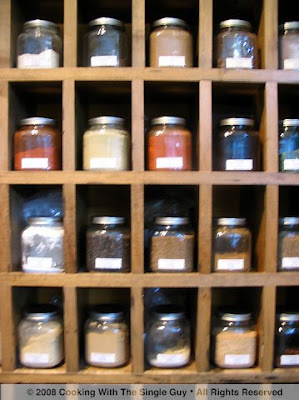 Sometimes it seemed like too many spices because you can feel overwhelmed over what to get. 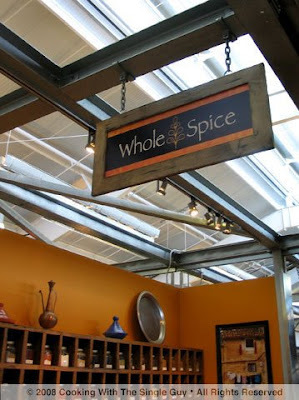 I think it's more a place to visit if you've been looking for a rare and specific spice. 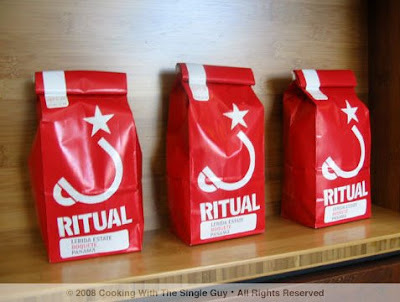 The main coffee stand in the back is Ritual Coffee from San Francisco's Mission District. It's funny how many of the stands at Oxbow have San Francisco ties. It's like they just transferred the Ferry Building to Napa. 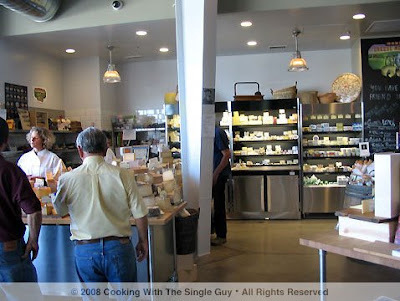 Other San Francisco-related places include the still-to-open Hog Island Oysters and Kara's Cupcakes. 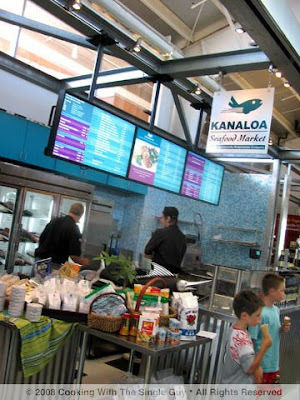 Here's one of the many food stands. 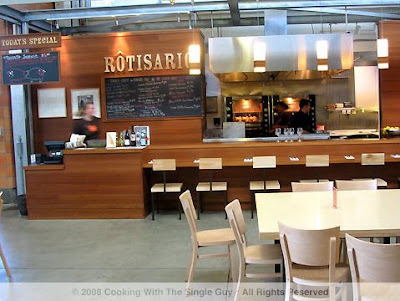 This is the Rotisario selling a variety of meat sandwiches. I didn't check out any of the food stands mostly because I just came from lunch. Hopefully another day. 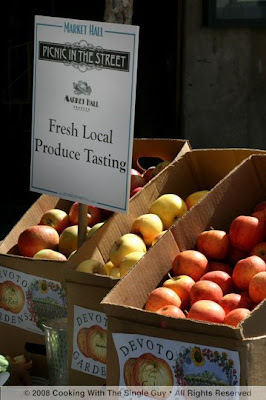 There was a fresh produce market front and center. It was organic and fresh, like you would expect. 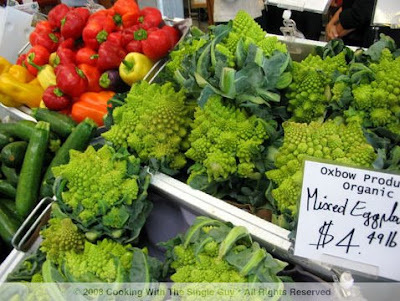 Look at these beautiful Romanesco cauliflower. 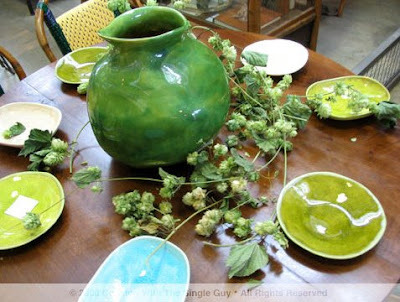 Everything at the store was perfect-looking, and of course, pricey. I just thought this display at The Kitchen Library store just looked so pretty and Napa Valley. ... and this cheese store above. 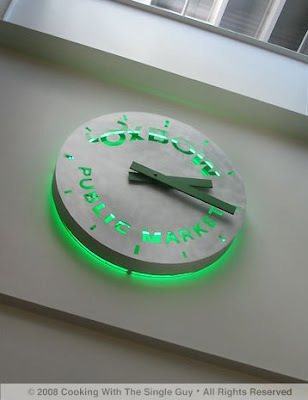 Oxbow Public Market is definitely more bustling since my last visit. Just like the Ferry Building in San Francisco, there's just a lot of pricey things that are pretty to look at but not sure if I really need. 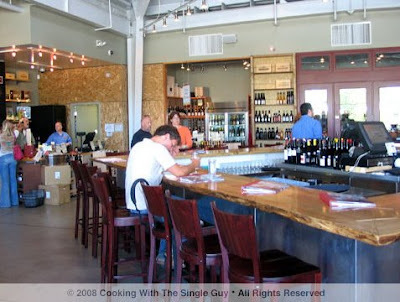 But it's nice to check out, and it's probably great for the tourists visiting Napa Valley.